Article: Risk Approaches. Written for GMs. Excellent for writers, too. I really like this article. It's a good way to think of things. Awards: Hugo nominations are open. Here is my eligibility post. Don't be afraid to list what you have done, too. Interesting: Books2Read. This is a site to create universal links for your books. 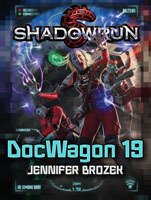 Here’s an example: DocWagon 19.
Review: Nice review of The Jim Baen Memorial Award: The First Decade anthology in Analog. I'm not called out, but I like the review. Pre-order: The Prince of Artemis V by Jennifer Brozek and Elizabeth Guizzetti. It's my firest comic book! Isn't it pretty?